Radish takes more than average skill to produce because it grows quickly over a short period of time and is therefore susceptible to a multitude of issues. Wise in crop growth, Muranaka Farm has developed the expertise to master this process. In fact, we've provided an uninterrupted supply for 30 years. No wonder we're the largest shipper of bunched radish in the country. 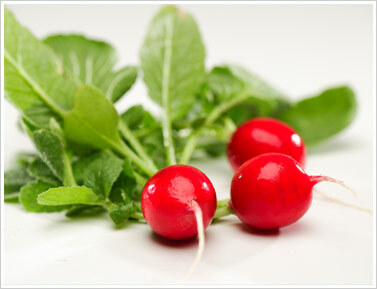 Our radishes have strong, dark-green tops and a shiny, deep red appearance. They are consistent in bulb size - a minimum of an inch in diameter - and come in 11-13 count bunch size. While other suppliers may run out of radish for a week or two at times during the year, our different growing locations enable us to shift production to fill any gaps that may arise.